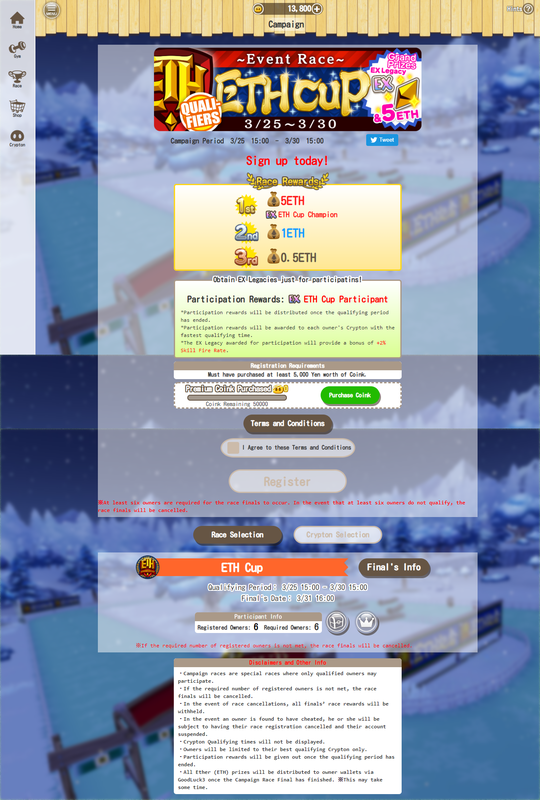 [Campaign] New Event [ETH Cup] Now Open! We have a brand-new event rolling out today, the [ETH Cup]. For those of you who liked our previous ETH event, we have increased the ETH prizes so for sure check it out if interested, especially if you missed out on the last one. Check below for the details! The top 6 ranked Crypton from the qualifiers will be chosen to race in the finals. Qualifying Crypton will be automatically entered into the race finals. The race finals will be cancelled if at least 6 owners do not qualify. Participation rewards will be distributed to Crpyton who participated in the ETH Cup qualifiers.